Typically, when the last bell of the school day rings, teacher's all over the world hope to leave most of their teaching duties and responsibilities within the confines of the educational institution. Native English teachers are no exception, often keeping their fingers crossed that they don't run into their students too frequently (read: never) once the school day has let out. For Michael Teacher however, those rules don't apply. With a heart of gold and an uncanny ability to build meaningful relationships with folks of all ages, Mike has had a long-running tradition of meeting up with his students at OEC for a cup of hot choco or other cafe specialty. 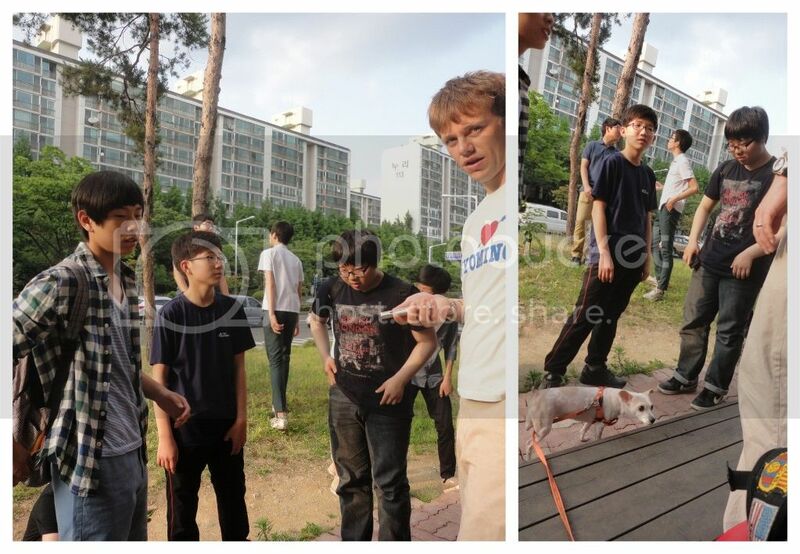 Having recently decided that Korean Public Schools will no longer be their source of income, Mike has made an even greater effort to convince/remind his students to swing by the cafe for a delicious drink, a round of Uno or in the case of the young boys pictured above, a bit of footy (soccer). As if meeting up at cafes and enjoying some card games and soccer with his students weren't enough, Michael Teacher has also become one of Namseon Middle School's biggest sport fans. For the previous two weekends he has made his way over to Wolpyeong Middle School to introduce Lady Annyeong to his students and to cheer his students on in games of basketball and soccer. With his time in public school winding down, Michael Teacher is taking the necessary initiative and giving these final months his all, Namseon Middle School has been fortunate to be served by such a caring and invested educator.